If you want to copy a single asset that does not require any other files (e.g. texture or rendering settings) from another project, you can do it in any of the ways listed here. Composite assets (e.g. a material requiring a texture, or a node that requires several materials linked to plenty of textures) should be migrated from one project to another carefully. To simplify migration of such assets between the projects it is recommended to keep all linked assets (e.g. a node with all meshes, materials and textures it requires) in the same folder. In this case you can simply copy such folder from the data folder of the source project to the data folder of the destination project. Do not modify or delete *.meta metafiles because they are necessary for keeping links and dependencies between assets. 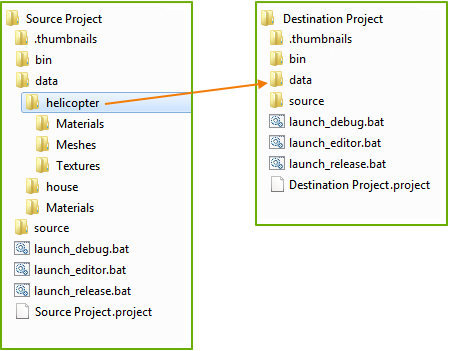 As you open the destination project in the UnigineEditor, all assets from the new folder will be imported automatically with all links and dependencies preserved and you'll be able to use them.